For the second year in a row, the Williamsport Crosscutters are partnering with Williamsport Mason's Lodge #106, Dixon AC & R and Webb Weekly to salute local heroes on Military Appreciation Night, July 3 at Susquehanna Bank Park when the Cutters host the Auburn Doubledays at 7:05pm. As part of the night, the first 1,000 fans will receive a 20-card set featuring local Military Heroes courtesy of MasonicTemple Assocation of Williamsport, & Webb Weekly. "We had such a great response to this last year, that it just made sense to do it again in 2015 and honor more of our local heroes," stated Gabe Sinicropi, the Cutters Vice-President of Marketing and Public Relations. 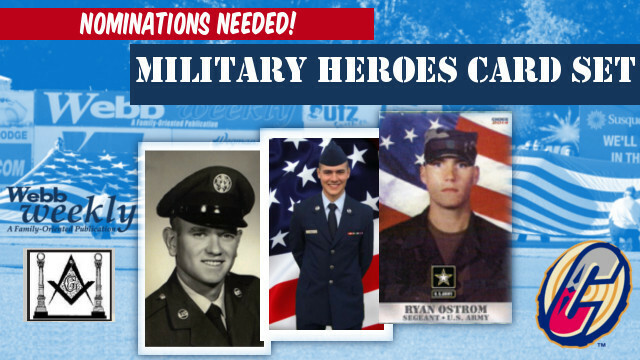 Fans are asked to nominate local Military Heroes for possible inclusion in the card set. Nominees can be an active or retired member of any branch of the service. Nomination forms will be printed in Webb Weekly on March 18 and 25 as well the April 1 and 8 editions. Forms can also be downloaded by visiting crosscutters.com or picked up at the Crosscutters offices at Susquehanna Bank Park. Those who are included in the card set will be invited to the July 3 game, honored on the field and presented with their own 8"x10" copy of their card. Those who are deceased will be represented by their family. The deadline for nominations is April 24. All nomination forms must be accompanied by a photo. Electronic photos are preferred but not required. All photographs will be returned. The Cutters 2015 home opener is slated for Saturday, June 20 as Williamsport hosts the State College Spikes. Season tickets and Bonus Book mini-plans are now available by phone at (570) 326-3389, online at crosscutters.com or in-person Susquehanna Bank Park. The full 2015 Cutters promotional lineup is scheduled to be released in late April.